At St Mark’s we have an active School Council. The children are chosen by a democratic vote by their class peers and they are given the responsibility of taking the views of each class to our weekly meetings. Ann Lyons our HLTA leads the School Council meetings on Friday afternoons, overseen by Ms Braithwaite (Headteacher). In doing so, the children come to understand responsibility and to appreciate the value of being an active part of our community. 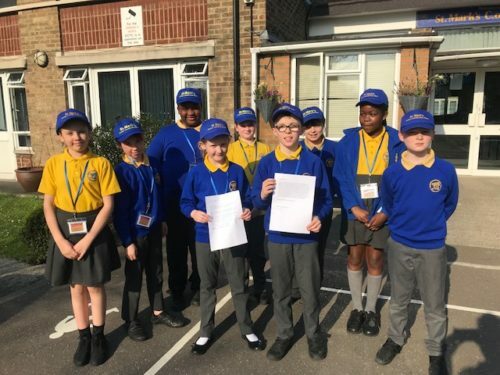 This year we have appointed a Junior Leadership Team, made up of 6 children from years 5&6 who work in conjunction with the Senior Leadership Team to monitor and evaluate learning and teaching. We value our Junior Leadership Team and are committed to listening and developing their ideas to improve our school. This term they will be working alongside subject leaders to evaluate playtimes and learning at St Mark’s.